First of all, we want to assure you that you really can use our demo cluster at no cost and there are absolutely no strings. Our demo cluster has been helping clients and non-clients alike test their code on the latest hardware and software for years now and we have the procedure down to a science. So if you have any misgivings, give us a call, send an email, or Live Chat—our engineers are happy to help. We are constantly adding new hardware and software as soon as it becomes available and one of our latest additions is Intel’s Omni-Path (which we love). In a nutshell, Omni-Path is a high-performance communication architecture offering low communication latency, low power consumption, and a high throughput. 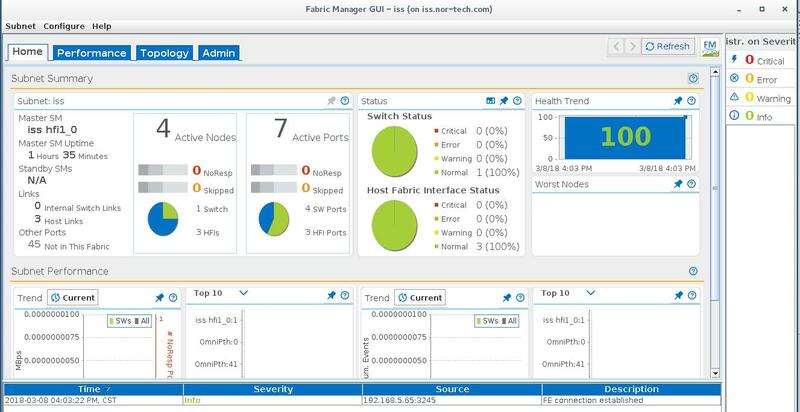 It has powerful monitoring and analysis tools such as the Graphics User Interface Fabric Manager—see the attached. Contact us now to learn more about our demo cluster or to sign up and get started. Call 877-808-1010, check out the demo cluster page, Live Chat or email: info@www.nor-tech.com.